The Cutting Cafe Holiday Planner ... and A Giveaway! Humble beginnings--think manila file folder--don't hold back this ultra-creative holiday planner from papercrafter Daniel Dobson! Blogging as For The First Time, Daniela's got a sizzling entry in the Christmas pocket planner category. Sewn and stamped, inked and embellish, this Christmas pocket planner is a knock-out. And don't miss the clever use of small binder clips as both embellishment and structural device. It's a stunner! Zowie! Look at this amazing Christmas planner, created by craft blogger Mrs. B from Mrs. B's Craft Room: a house-shaped confection of a holiday planner. The unique shape was created by using a Cricut Personal Electronic Cutting Machine ; binding appears to have been done with a Bind It All craft tool. Inside, computer generated lists, calendars and planners have been glued to each house-shaped page. While Mrs. B created her own lists, we think you could use down-sized Christmas pocket planner pages from Organized Christmas. Holiday Planner: Lynn's Long, Lean List Machine! Here's a fresh entry in the Christmas Pocket Planner category: this pretty vintage holiday planner from blogger Lynn at Millers-Ink. Starting with Nicole Heady's free pocket planner template, Lynn added custom-cut tags made with a Cricut Personal Electronic Cutting Machine . These tags can be circulated to friends and family to gather gift suggestions for the big day. With a vintage color scheme, stamped accents and smartly-embellished front cover, Lynn's planner is a long, lean home for lists and planner pages! Coordinating Products Create Holiday Planner Magic! Simplicity doesn't have to be boring; check out this altered composition book from the Heart of a Lamb blog! Starting with a simple composition book, blogger Doresa's holiday planner takes advantage of coordinated patterned paper, embellishments and stickers from stamping supplier Close To My Heart. 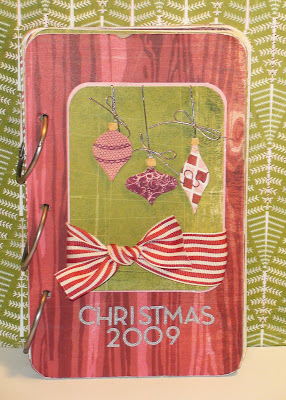 Small and sweet and easy to use: check out Laurie's Joyful Christmas Planner! Featured on the Stamp a Sweet Impression blog, this tiny planner is based on 3-by-5 index cards. Small it may be, but with helpful dividers Laurie's planner puts everything you need to get organized for Christmas in the palm of your hand. But the embellishments take this planner over the top. As Laurie says, "If there ever was time to add tons of bling to your projects, then Christmas is the time!! :-)"
Who says Christmas planners need to be over-large ... or over the top? 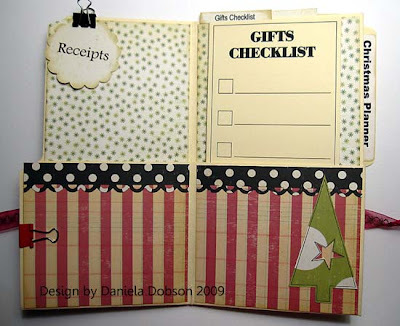 Check out this sleek solution from the Givers Log blog: a holiday countdown checklist. As befits the spirit of the season, the blog offers free downloads. With versions in in blank form as well as in a pre-printed 12-week countdown, this is a minimalist approach to Christmas organizing ... and it's pretty, too!